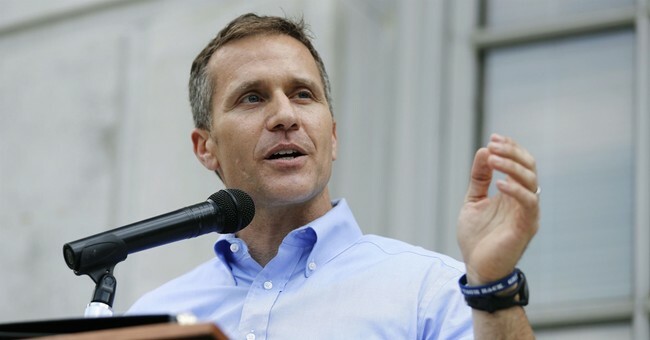 Eric Greitens, a Democrat turned Republican, who also happens to be the Governor of the Show-Me State was indicted and booked last week on a felony invasion of privacy charge. The grand jury indictment stems from a photo that Greitens, a married man, allegedly snapped of a partially clad lover during a sexual tryst in the basement of his home in the spring of 2015, one year before his winning gubernatorial campaign. This is a big story, one that has great ramifications for state and national politics. It is a commentary on the crashing of a promising career. It includes the grim reality of a family torn apart and serves as a warning that pride turned to recklessness usually equals fatality. On January 10, 2017 Missouri Governor Eric Greitens and his wife, Sheena Greitens, issued a joint statement admitting that the governor had engaged in an extramarital affair in 2015, and that the couple had dealt with it “…honestly and privately.” The couple issued the statement as a local CBS affiliate in St. Louis aired a report on the same topic, but added that Greitens snapped the photograph of his paramour, and threatened to spread the picture if she exposed the affair. Greitens’ statement made no mention of these contentions, but his attorney denied the blackmail allegation. Greitens has refused to answer further questions on the matter. But, he is now scheduled to appear in St. Louis Circuit Court on Friday, March 16th. The fact of the matter is that rumors of this fling have been making the rounds in Missouri political circles for a couple of years, so the confirmation of their truth is not completely shocking, even though Greitens ran for governor as a family values conservative, and used his wife and young children as campaign props to help establish his image. Needless to say, the media, waiting for this shoe to drop, are having a field day with the revelations, and seem to be enjoying it a little too much. Media delight, notwithstanding, there are some problems with this action. There has been no criminal complaint, as the woman in question has refused to divulge information with police, reporters, or attorneys. She has been subpoenaed. Presumably she has given testimony that this led to the indictment. Greitens’ few defenders among the public, and his legal team, have noted the unorthodox nature of these proceedings, and have argued that the indictment should be dismissed. Regardless, few are expecting that the genie, now out of the bottle, can be easily returned to confinement. Before we continue forward, it would be appropriate to ask a simple question: Who is Eric Greitens? While this might seem apparent, the real Greitens is something of a mystery. He is a man of formidable credentials, something of a walking resume. Greitens, a Duke University graduate and a Rhodes Scholar, claims an Oxford doctorate among his academic trophies. He then pursued a military career, finishing Naval OCS in 2001, and graduating from the Navy’s elite Underwater Demolition/SEAL school in Coronado, California in 2002. He served numerous overseas deployments, and rose to the rank of Lieutenant Commander while on active duty. There is no doubt that Greitens served his country bravely and honorably. There is another side to Eric Greitens. Much of Greitens’ sterling CV seems to be the product of assiduous planning, with an eye toward the future, and running for public office. In fact, many Missouri Republicans are convinced that Greitens has no real interest in the state, but that he considered the governorship a useful stepping stone to the Presidency. He jumped from the Democrats to the Republicans in 2015 without comment. It is very likely that he knew he could not win a statewide office with the dual handicaps of Democratic Party membership and St. Louis residency, both of which are electoral poison in outstate Missouri. During his primary campaign for the governorship, Greitens offered little but a recitation of his SEAL service to recommend him. In 2016, an anonymous political attack surfaced charging that Greitens exaggerated his accomplishments and was mischaracterizing his SEAL service. He responded by releasing his military records, and uploaded testimonials from fellow special forces comrades. While this answered any questions about his service, Greitens could not shake the perception of himself as a political image builder like Gary Hart and a service recorder exaggerator like John Kerry. Greitens won the Missouri GOP primary and ran for the governorship in 2016. He eschewed the help of the state GOP establishment, preferring to spread his message on Facebook and other social media. He avoided questions from reporters, dodged interviews, and spent an inordinate amount of time stressing his “outsider” status. To that extent, he lobbed insults at the experienced lawmakers in the state, often his own Republican brethren, who would ordinarily have championed his agenda. Greitens has, in effect, burned his bridges. He no longer has any real base of support as he has alienated his own party members.The Democrats will give him no help, as we can see from the politically-motivated indictment. The media are gleeful and gloating at the sufferings of young Eric. Others who might have been inclined to give Mr. Greitens the benefit of the doubt have walked away from him. Adultery does not play well in bible-belt Missouri. What does, the future hold in store? Regardless of the outcome of the legal proceedings, Eric Greitens career and reputation are in ruins. His promising future is finished, and his family issues are probably just beginning.His wife Sheena, a law professor at the University of Missouri, has been steadfast up until now. In fact, Mrs. Greitens has endured her share of grief beyond the moment. She was robbed at gunpoint in the fall of 2016 when she left a restaurant in St. Louis trendy Central West End neighborhood. Eric Greitens will consider his fall and understandably will blame the media, the opposition, a politically-biased prosecuting attorney and all sorts of other goblins in his universe. The sad fact remains that in the world today, Eric Greitens can blame no one but himself.